Ryorin's Ramblings: Brand New Movie Franchise: Spidey Gets a Reboot. Again. Brand New Movie Franchise: Spidey Gets a Reboot. Again. As You may have picked-up on from previous posts, I am rather attached to Spider-man. Because of that, I have a lot to say about this topic and this post is kind of long. Please bare with me and feel free to get a snack at the intermission. Thank you. For those of you who didn't hear back in January, Spider-man, quite possibly the most popular comic-book movie franchise around, is getting a reboot. That's right, folks, the fourth movie starring the world's favorite arachnid-themed costumed hero will ignore the previous three and will have a completely new director and cast. The main reason for this change is apparently director Sam Raimi's lack of confidence in his ability to make Sony's deadline for a May 11, 2011 release, but there were apparently quite a few creative differences between the director and the company as well. They wanted lots of villains, he wanted one, they wanted one script, he wanted another, etc. Apparently similar issues came up with the third one, and we all remember how well that turned out... Any way, now Marc Webb will be directing instead of Sam Raimi. Ultimate Spider-man. In 2000, Marvel decided to up-date and re-imagine the Marvel Universe and make it more accessible to new readers. Thus, Ultimate Marvel was born, a seperate contanuity from the main Marvel titles featuring Spider-man as it's flagship title. 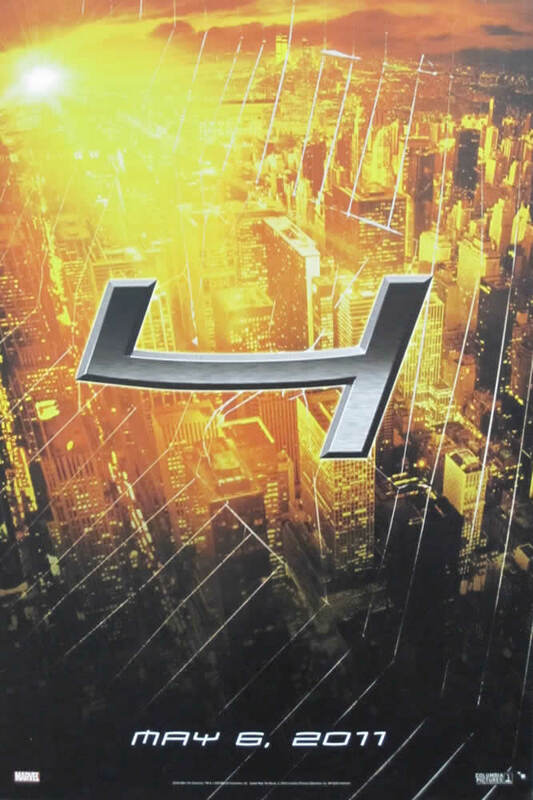 Ultimate Spider-man takes place in contemporay New York, New York (except with mutants as the most pressing political issue), focusing on teenage superhero drama of high-school-er Peter Parker the superhero. 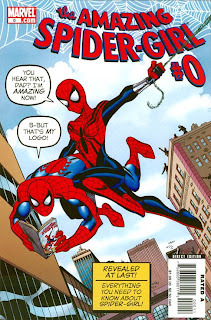 Next, the main-Marvel continuity Spider-man got a major reboot in 2007's "One More Day" storyline , with the after-math chronicled in 2008's "Brand New Day" storyline. 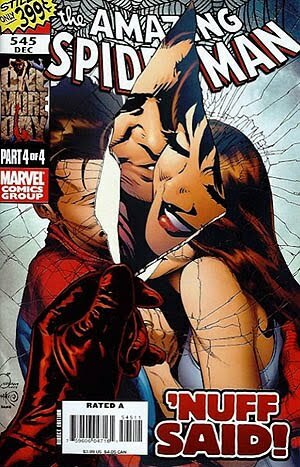 Basically, to save Aunt May's life Peter Parker and Mary Jane sell there marriage to the devil. This means that now they were never married, and this actually affects a lot. Peter and MJ's relationship is now rather frosty, Peter's living with his Aunt again, Harry never died, Mayday was never born, and the world no longer remembers that Peter Parker is Spider-man. A few people apparently have some vague memories about Spidey's unmasking, they can't remember his face. Spider-man, changed forever. And then, 2008 to 2009, there was Ultimatum. Technically, it was an event that relaunched the Ultimate Marvel universe as "Ultimate Comics". 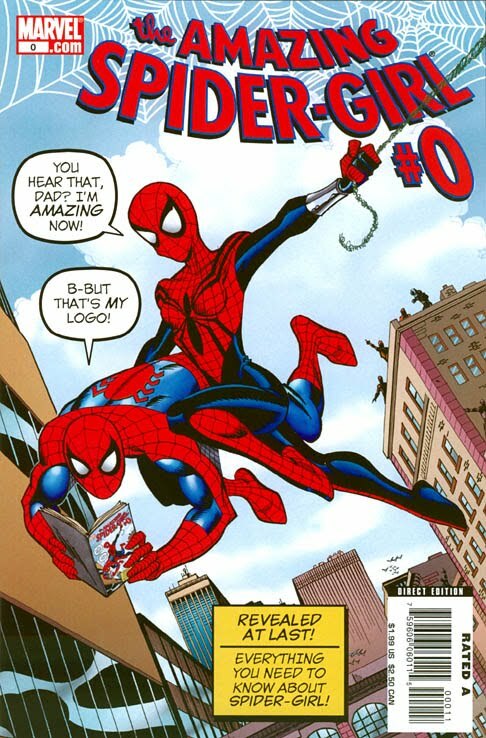 But it changed everything, with the start of the "Ultimate Comics: Spider-man" series set six months after Ultimatum. Why they needed to reboot the rebooted universe is a question I can't answer, especially seeing how well Ultimate Marvel was doing before the event. Anyway, Spidey's now working at a burger place and dating Gwen Stacy's clone and fighting crime with his classmate/ ex-girlfriend Kitty Pryde. Yes, that Kitty Pryde, or at least the Ultimate version of her, who is still both teenage and mutant, but significantly less ninja. Those are the three big reboots that I've noticed, but there was apparently one back in the ninties as well. Anyway, Spidey seems to have accidentally webbed-up a reboot-bug at some point and ended up caught in its grasp. Now, what of the new movie? What can we expect when we walk into the theater on July 3, 2012 with our gummi-bears and extra-large cokes? Well, apparently the reboot will go back to Parker's high school days and focus on his life as a teen-aged superhero. Oh, and it'll be in 3-D. Because some thought that would be a good idea. Feel free to get a snack and enjoy Some Random Guy's reaction to the news of the reboot. Ultimate Spider-man: the Movie. The first question that popped into my head when I head about the reboot (other than, "Again?") is whether or not the teen-aged drama movie reboot will be based on the teen-aged drama comic reboot from ten years ago. I really don't think I need to spell out why. Who will be Spidey's girlfriend? Will it be the well-known fan-favorite Mary Jane Watson? 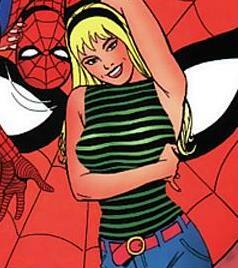 The tragic first-love Gwen Stacy? Perhaps Kitty Pryde, the intangible X-man that dates Peter in the Ultimate comics? Okay, so it probably won't be Kitty. But still: MJ or Gwen? Though the world may now know her as "that blond girl who danced with Spidey in Spider-man 3", in the comics, Gwen Stacey was Peter's first love and her death was an incredibly significant event in his life. Let's face it: her character was ripped-off in the last movie. This reboot could give her story the fair portrayal that the other movies didn't. On the other hand, Pete and Mary Jane were married for around thirty years. MJ's a red-haired, long-lasting, well-known, fan-favorite character that Hiro references in Heroes. Could Webb really ignore her? There are more than just the "either/or" options, however. Considering that this movie is going to have more "teen-aged drama", perhaps they'll have a love triangle. Or maybe they'll have Gwen in this film and MJ later on. Perhaps they'll even have Gwen's tragic end in this film or the sequal. The Origin Story. This one seems to be the major concern of fans out there: will the movie be Spidey's origin story again, or will they simply have flashbacks/ exposition/ a small potion of the film about the origin and them move on with the story? The first movie was all about the origin, so are they really going to do it again? I personally like the idea one of the interview-ees has here, in which Peter has the powers at the beginning of the film and is trying to figure out how to juggle them and life. The Costume. At first glance, this seems like a silly question. I mean, Spider-man's costume is a classic. Marvel branded their comics with his masked face for years. Why would they change it? Well, apparently there was a slew of possible costume designs for the first film before they settled on the classic comic one, including a red-on-black number. And, if they do stick with the iconic red-black-and-blue, They probably won't use the same costume they did for the past three films. They're starting with a clean-slate so they're probably also going to start with a new design; the new actor will probably be a different fit than Toby, anyway. The Setting. Another idea brought up here: since we've already seen Spidey do modern-day NY, could this be set back in the sixties, when the comic started? Kind of like how Batman: The Animated Series was sort of set in the forties? My thought on this: intriguing idea that is not gonna happen. Sony probably wants to make Peter relate-able to today's youth (thus: high school) and, really, they just scrapped everything and are still aiming at a 2012 release date. Making it a period piece would complicate things and make teenage Petey rather less relate-able. Uncle Ben. A huge part of the first movie was focused on Uncle Ben, his death, and Peter's blaming himself. If they set the film after the origin story, they set it after Ben's death as well, but what if they don't? Will Uncle Ben's death cause the cycle of guilt to start-up again? If it does, will they ever be able to have the Death of Gwen story in this series as well? And will they repeat "With Great Power etc. etc." all through this film like they did the first one? Uncle Ben was too great of an influence on Peter for them to just ignore him and his death, so how will they treat him? Sony wants to make a movie about a spider-suit wearing teenager and the viewers have already gone through Spider-man's hero's journey. Why not make this next movie about Spider-girl, Peter and MJ's high-school daughter May "Mayday" Parker? Just imagine the possibilities. The movie could tell her origin story without dwelling on Peter's, they wouldn't have to completely re-imagine a story the audience is already familiar with, the fans of the Raimi movies would be happy because that continuity wouldn't have to be tossed out the window, the comic fans would be happy because the movie would still be based on the comics, and no one would have to deal with the teen angst of Mayday trying to hide her secret identity from her parents ("Honey, did you see the news? Apparently there's a teen-aged girl running around in your old suit and web-shooters and with your powers. Oh, is it just me or has May seemed a bit distracted lately?"). And, with her new series Spectacular Spider-girl starting in May, the timing couldn't be better for the announcement! Okay, so this isn't going to happen. Hey, I can dream, can't I? The Villain(s). I know, obvious question. But really: who will it/they be? The original plan for Spidey the fourth was the introduction of the Vulture, though I also believe there were plans involving Carnage; will they stick with that or go back to Gobby? Or Kingpin? Or someone else? Spider-man is Marvel's equivalent of Batman as far as the Rouges Gallery is concerned, so there're lots of possibilities. This reboot opens up new door for Spider-man's story and franchise. How will these new opportunities be utilized? Let's let the speculation fly (at least until we have more concrete info on the film's actual content). What comments, questions, hopes, dreams, or concerns do you have regarding this Brand New Movie Franchise? Other than that Spidey should have a giant robot, I mean. Really. It's been done.